Is there any law this administration is willing to honor? 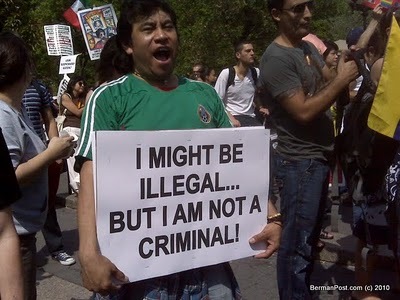 The new measure would apply to illegal aliens who are relatives of American citizens. Here is how it would work, according to a Department of Homeland Security (DHS) announcement posted in today’s Federal Register, the daily journal of the U.S. government; the agency will grant “unlawful presence waivers” to illegal aliens who can prove they have a relative that’s a U.S. citizen. Currently such aliens must return to their native country and request a waiver of inadmissibility in an existing overseas immigrant visa process. In other words, they must enter the U.S. legally as thousands of foreigners do on a yearly basis. Besides the obvious security issues, changing this would be like rewarding bad behavior in a child. It doesn’t make sense. But the system often causes U.S. citizens to be separated for extended periods from their immediate relatives,” according to the DHS. The proposed changes, first announced in January, will significantly reduce the length of time U.S. citizens are separated from their loved ones while required to remain outside the United States during the current visa processing system. The administration also claims that relaxing the rule will also “create efficiencies for both the U.S. government and most applicants.” How exactly is not listed in the Federal Register announcement, which gives the public 60 days to comment. That’s only a formality since the DHS has indicated that the change is pretty much a done deal. And the lawless regime rolls on.